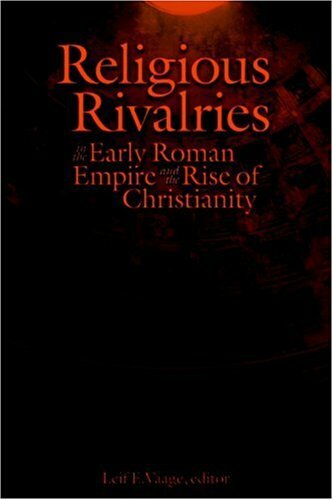 "Religious Rivalries in the Early Roman Empire and the Rise of Christianity" discusses the diverse cultural destinies of early Christianity, early Judaism, and other ancient religious groups as a question of social rivalry. The book is divided into three main sections. The first section debates the degree to which the category of rivalry adequately names the issue(s) that must be addressed when comparing and contrasting the social "success" of different religious groups in antiquity. The second is a critical assessment of the common modern category of "mission" to describe the inner dynamic of such a process; it discusses the early Christian apostle Paul, the early Jewish historian Josephus, and ancient Mithraism. The third section of the book is devoted to "the rise of Christianity," primarily in response to the similarly titled work of the American sociologist of religion Rodney Stark. While it is not clear that any of these groups imagined its own success necessarily entailing the elimination of others, it does seem that early Christianity had certain habits, both of speech and practice, which made it particularly apt to succeed (in) the Roman Empire.